It is now well recognised that messaging channels are central to the growth of conversational commerce, with fundamental changes in consumer behaviour driving the evolution of customer journeys and business processes. Businesses are increasing investment in mobile and interactive messaging channels to support digital transformation. And in a world where businesses serve, engage and transact with customers through messaging channels, trust is the most valuable currency. 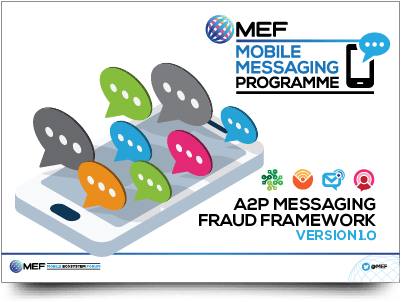 Collaboration and transparency across all stakeholders in the industry is paramount, and the MEF Future of Messaging Programme with its A2P Fraud Framework aims to create a more transparent, innovative and fraud-free market. There is this misconception that network operators are likely to lose revenue if all fraudulent or illegal messaging routes are shut down. We at iTouch are of the opinion that this is certainly not true. On the contrary, if all messaging providers used legal routes the network operators are more likely to benefit from the revenue too. Certain routes such as using sim farms, take advantage of SMS bundles provided by networks wherein the messages are provided at hugely discounted rates, or for free. Hence it is the rogue messaging provider that benefits from this network-permitted loop hole, and certainly not the network operators. Failing this “cheaper” option being available, it is very likely that the end user will pay the market price otherwise, and even in the case where some end-users refuse to pay the going rate and seek alternative options of marketing their businesses, the network operators and legal messaging providers are still likely to see increased revenues. The network operators may also find that their reporting on active sims may also be skewed as a result of sim farms. The A2P messaging ecosystem is complex, since delivering and charging for a message involves a number of parties. The threats are many and varied, and so far we have identified 11 key and distinct types of fraud in the ecosystem costing the industry $2 billion USD annually and damaging consumer and enterprise trust. Enterprises require high quality, secure and timely delivery of messages and are willing to pay a reasonable amount of money for this, but fraud threatens this and damages the ROI Enterprises rely on to decide whether or not to use SMS as a communication channel. Consumers love SMS, it’s a part of everyday life and they trust it, because it’s rarely abused unlike email. Instances of SMS phishing and malware damage this trust and will make them question if they can trust legitimate messages being sent to their handset, so though not rampant preventing fraud is paramount to preserve this direct consumer channel. Fraudsters are smart and scrutinize where in the ecosystem they can hide and exploit it. Without members in the ecosystem working together it is very difficult to detect and prevent fraud. The opportunity is there to reduce fraud and its cost substantially, and ensure SMS messaging remains a powerful and trusted channel. There are few communications channels that can be as ubiquitous and accessible as SMS. Our industry cannot afford these strengths to become vulnerabilities. Criminals and fraudsters have become smarter when targeting messaging platforms as they know not only are these used by billions of users worldwide, but they also enjoy almost open rates as close to 100% as anyone could reasonably hope. This can’t be a solo crusade and relies on the industry working as a collective to ensure consumers continue to think of SMS as a trusted platform. By working closely together, sharing information and best practice, our sector can create a shield against these threats and protect customers and consumers. A coordinated approach will identify the weak points which are liable to attacks and ensure they are protected with the right tools. Communication and engagement is built on trust; eradicating those rogue elements and routes which bring down the overall name of SMS will guarantee the continued success of SMS. JT is delighted to be a founder member of the MEF Mobile Messaging Programme. We are already very proud of our partnerships with both A2P messaging providers and our many valued roaming partners in the MNO community – this programme is an exciting development for the industry. It is clear that A2P messaging represents a significant opportunity for all parties in the A2P ecosystem. This programme will promote much more cohesive and informed relationships between stakeholders – sharing knowledge and stronger alliances are critical to our efforts to eliminate fraud and build confidence in the A2P market sector. From enterprise demand all the way through to the MNO servicing the subscriber – the development of a secure, high quality framework is critical to the success of this significant market opportunity. The solutions to the phenomenon of SIM Farms and even the way some grey routes are used are not straight-forward at all. Simply shutting them down was found not to be the answer as telcos risk blocking traffic from strategic partners and trusted aggregators. While the clean-up process is still in its infancy, organisations such as the MEF are working towards aligning the industry to tackle such messaging abuse. From Telefonica’s perspective, it could mean that SMS prices need to rise a little – not too much as to decimate the volume – but enough that telcos can help police networks. With reputation, safety and privacy hanging in the balance, it’s money well spent and means you don’t have to choose between quality or cost.